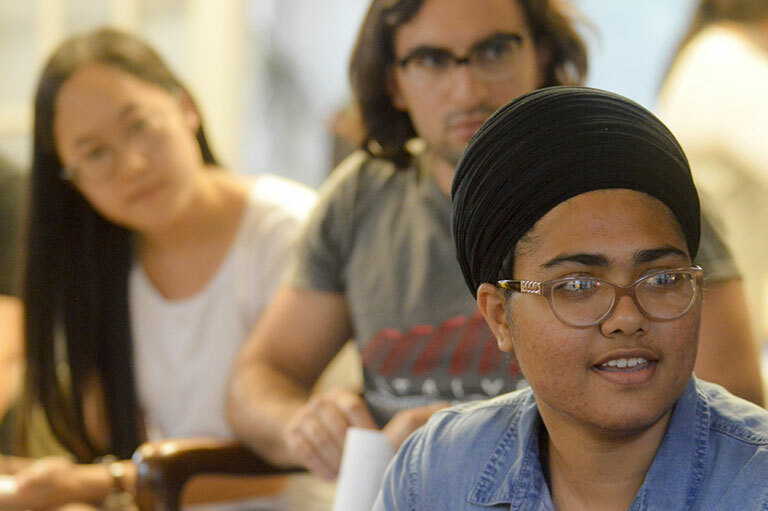 The UndocuHoosier Alliance met for the first time Tuesday in the living room of La Casa Latino Cultural Center to establish a new club name and set specific goals for the club’s future. The UndocuHoosier Alliance is a new club that seeks to create a community of students who entered the United States without documentation and their allies. The club has been the culmination of the work of second year master’s student Willy Palomoand La Casa Director Lillian Casillas-Origel. Palomo also helped organize UndocuStories, an event that featured poetry from two poets and four speakers from the Indiana Undocumented Youth Alliance, last March. Palomo said the group will focus on a few top priorities, including creating an undocumented student scholarship and recruiting and visiting undocumented high school students. “We have to support one another,” Palomo said. About 25 potential members gathered Tuesday at La Casa. The meeting began with an introduction from Palomo. All new members introduced themselves. There were a variety of people in attendance including faculty, undergraduate students, master’s students and Ph.D. students. Then, the attendees divided into three groups to discuss three immediate club goals: sponsoring the Indiana Undocumented Youth Alliance, creating a brochure to inform undocumented students on attending college and creating a club constitution. “We’ve got about 100 balls juggling in the air right now,” Palomo said to the group. The UndocuHoosier Alliance then reconvened as a club, discussed their ideas for the specific areas and voted on changing the name. The club existed in 2004 as DREAMIU but was disbanded. Senior Audrey Maston was one student in attendance. She said she was inspired to come after attending the UndocuStories panel and participating in an immersion program. Third-year Ph.D. student Denise Ambriz was also in attendance. She said she wanted to find a way to support undocumented students at IU.